WELCOME to the best Alternative Fitness Program exclusively for women. Pole Dancing for Fitness is an addictive workout that provides amazing body transformations. Pole Jam Factory is the largest studio in King of Prussia, PA with 16 - 14'6" poles and a separate acrobatics yoga studio as well. Pole Dance Fitness is the most rapidly growing sport in the country. Pole is the most fun and effective way to get fit and to lose inches off your waist. We have classes 5 days a week. Mon - Thurs. and Saturdays. We have Beginner Pole, Intermediate, Advanced Pole Classes, Yoga, and Acrobatics classes as well. 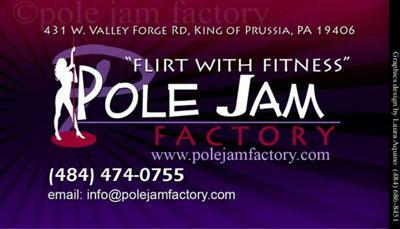 Pole Jam Factory will host your birthday or bachelorette party too. All our Pole Jam Factory classes cater to every woman regardless of age, weight or height. We guarantee that whether you come to rediscover your inner sensuous self through dance, or you join because you want to get in the best shape of your life... you will find what you are looking for with us! Flirt with Fitness! All fitness levels are welcome! For our prices, directions, and latest schedule, please contact us.